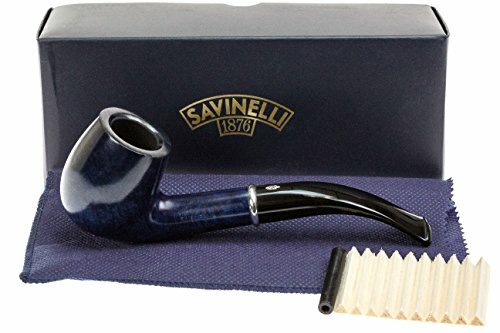 Brand: Savinelli Model: Arcobaleno Blue Style: 606 Shape: Bent Billiard Length: 6.09 in. / 154.80 mm. Height: 1.97 in. / 50.11 mm. Weight: 1.7 oz. / 48 g. Bowl Depth: 1.64 in. / 41.72 mm. Bowl Outside Diameter: 1.50 in. / 38.20 mm. Bowl Inside Diameter: 0.80 in. / 20.30 mm. Filter: 6mm Finish: Smooth Bowl Material: Briar Stem Material: Acrylic Package: Box Country: Italy Convertible: Yes Band: Nickel *Pipe measurements are approximate **Pipe pictures are not of actual pipe you may receive.